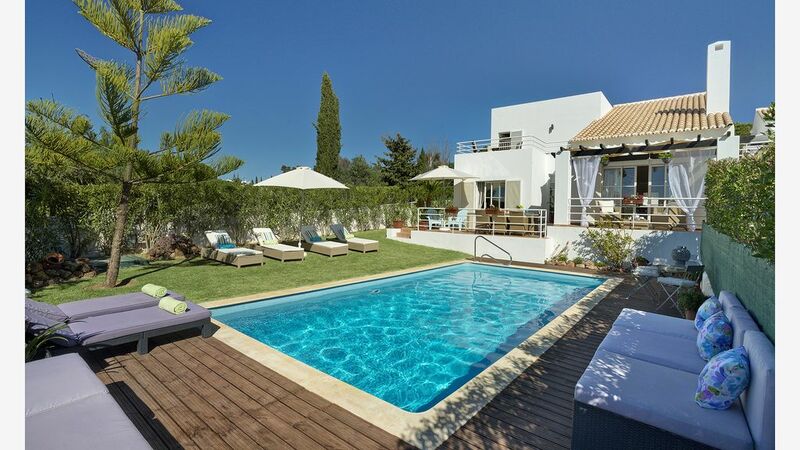 Villa in Guia, Nr Albufeira, Central Algarve, Portugal - Ideal for a relaxing holiday in the sun. Magnificent views over farmland towards the coast. This gorgeous 3 bedroom villa in Guia, near Albufeira, 5Km to the nearest beaches: Galé, Salgados, Lourenço, Castelo, Coelha, S.Rafael. The villa is located in a very quite country side area, 600 mts. from the famous village of GUIA and has magnificent views over farmland towards the coast line. Has its own private pool 8x4 mts which can be heated (at a supplement charge). It comprises, on the groud floor: 2 bedroom and 2 bathrooms being 1 ensuite. Spacious Dinning and Sitting area /open space fully equipped Kitchen. On the 1st.floor, a master suite with bathroom and north/south sunny terraces with beatiful panoramic views. This villa has fantastic outside space making this the perfect family holiday retreat. It is also fully air conditioned throughout. The owners, Manuel and Josie live in the adjoining villa, but your privacy is guaranted. Bed linen is changed at the end of the 1st week. Towells are changed on the middle and the end of the week. Pools towells provided, changed at the end of the week. Within five minutes of Salgados Golf Course. Zoo Marine Park is within 1 km. Water Parks very near. The overall holiday experience in this villa was great. The villa was as described.Very clean,very tidy with a great facility both in and out doors. The added bonus was having Manuel and Josie just next door to help with anything one could think of. My family and I have enjoyed our holiday immensely. The house was perfect for our needs and very well located. The pool was a nice size, the lawn immaculate, the house was very clean and well kept and with a lovely bright and airy kitchen/dining/living room. It cannot be faulted. The highlight however were the wonderful neighbours that we have grown to know over our week there. Highly recommended. Hope you and all family are well. I would like to thank you for your very kind words on your review. We stayed at this villa from 23rd June 2018 for 7 nights. It is a well looked after, clean and spacious villa. Extremely comfortable stay with a big pool and peacful surroundings, perfect for relaxing! Manuel was a very friendly host who left a lovely welcome pack, including fruit, meat and bread etc. He took us for a small tour on our first morning of the local area. Overall we had an amazing holiday at the villa, however a few dissapointing factors included the poor wifi connection. We struggled to connect to the wifi at all and when we managed to it was not good connection. Also no information regarding local area, how to call emergency services or how to work any appliances in the villa was left for us, from past experiences staying in many different villas this type of information should always be available. I would recommend staying at this villa if you are looking for a beautiful villa in a beautiful location, just a couple of tweeks would make it even better! Thank you Manuel for being so welcoming. Thank you for your kind review – it was good to hear that you enjoyed your stay at our villa. As we, the owners, live next door, we assume that any emergency, as well as routine queries about the villa itself, will be transmitted through to us to deal with immediately. We are, however, in the process of compiling a folder for each of our villas, with pages devoted to how to use the household appliances, telephone numbers (in addition to our own) for emergency services, nearest pharmacy, Doctor’s surgery, hospital etc, as well as pages detailing nearby attractions, days out, scenic drives, beaches, historical sites etc. We hope that our introductory drive to show you the locality was helpful in orientating you within your new surroundings. A beautiful bright villa within walking distance of the village and easy reach of gorgeous beaches! We are just back from a wonderful stay at Manuel’s villa. It was just perfect and met all our needs as a family of 2 adults and 4 children. We arrived to a welcome pack which was so thoughtful as the children were hungry and polished off the loaf, cheese and ham which were waiting on our arrival along with other items! Thank you Manuel! The pool was fab and we paid the supplement to have it heated which meant our morning swims were perfect too. The house is more spacious than the photos show with the high ceiling and open plan area allowing a big family to spread out. The double bedroom upstairs has two balconies off it. The sun hits one in the morning and the other in the afternoon. This gave again more space for everyone to find their own private area when needed. We hired a car and this allowed us to see the beautiful surrounding area really easily. We went to different beaches each day and found the Portuguese coastline amazing. We visited a couple of markets and neighbouring coastal towns aswell as the caves at Benegil which were definitely worth a visit! Even though we were only in the villa for a week, it’s central yet private gated location allowed us to maximise our activities very easily with very little driving. Oh yes the shopping centre 5 minutes from the villa was fab for some evening shopping as it was open until 11pm!!! We, 2 adults and 2 children, had a marvellous stay in Manuel de Castros Villa in July 2017. Quiet surrounding, fantastic pool, nice lounge area just outside parents bedroom overlooking the pool. Both breakfasts and a few dinners where spent in the gardens dining area. Walking distance to Guia (approx. 15-20 min walk) with a few restaurants. By car you are able to reach most of what the Algarvecoast has to offer within 30-45 minutes drive - nearest beach 10 minute drive, cave excursion tours (or boat trip to other beaches nearby in Aracao de Pers) 15-20 min by car. Algarve shopping center is to recommend for shopping ( 5 mins by car). Has a food court as well as a very nice sizable supermarket. In addition Manuel and his wife are nice caring hosts who certainly walked the extra mile! Assisted with car rental locally, due to late arrival made sure we had breakfast the following morning and assisted throughout our vacation with insightful tips on day tours etc. Thanks for a fantastic vacation! This was a great well spaced out villa for families,we stayed with our 3 kids on top floor while my sister's family stayed on bottom floor.my first impression was excellent, everything was clean and well maintained.The top floor had all you needed washing machine, dishwasher, cooking appliances even your own living area inside and eating area outside and in.The pool area was excellent and was cleaned a few times we where there.shops are about 10min walk however the owners live next door and took us 1st day shopping and was no problem taking myself a few times again though out our stay,plus offered us run to beach.our overall stay was fantastic, owners couldn't be more helpful, was lovely and quiet and would def recommend.plus only 10 min drive to old town albuefia.Thank you again for a great time Manuel and family from the Dawsons. This villa "CASA DA QUINTA" is within five minutes' drive of the glorious, sandy expanse of Praia da Galé. A slightly longer drive takes you the 10km to Albufeira with its lovely beaches, quaint old town, restaurants, bars and nightlife. The famous Zoomarine park can be reached in five minutes and there are two Water parks and horse riding centre also not far away. Faro Airport at 43km. Full driving instructions will be provided following acceptance of booking. Car Hire recommended but advice on airport transfers can be given. Situated in Guia, 10 Km west of Abufeira, the villa is situated in a tranquile area within easy walking distance of Guia with its famous Chicken Piri Piri restaurants. The village has all the amenities you would need: banks with ATM facilities, Pharmacy (English speaking), paper shop and post office, bakery, coffee shop and bars. There is a small, daily local market offering local produce. Less than 5 minutes'drive will take you to Algarve Shopping Centre where you will find a large supermarket and huge selection of shops and outlets. Booking Notes: We require a 25% booking deposit and the balance 60 days prior to arrival. *** By booking now for 2019, we guarantee you 2018 rates! *** Changeover Day: Changeover day: We are flexible. Maid service. Notes on prices: Prices are for the property per week in UK Pounds and Euros.